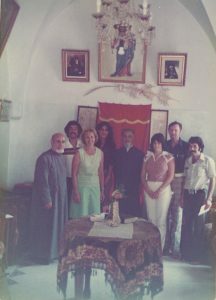 During a homestay in the Middle East several decades ago, visiting a friend his son had met at Eastern Mennonite University, Norm Rittenhouse heard a firsthand story that deeply troubled him: bulldozers ripping up fertile farmland, the owner jailed, and no compensation offered. 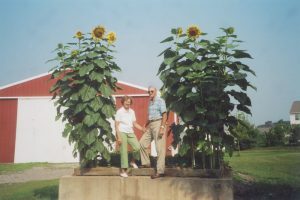 Because Norm and his wife, Alice, farmed several hundred acres in Harleysville, Pennsylvania, hearing that story created a near-visceral yearning for “justice and peace,” Norm said. The Center for Justice and Peacebuilding (CJP) at Eastern Mennonite University, they thought, was a place that might help bring that about. Now, in honor of Alice, who died in 2016, Norm has established the Norman and Alice Clemmer Rittenhouse Endowment for World Peace, to provide an annual scholarship award for students from the Middle East at CJP. “The quicker you start something, the better it is,” he said. This fall he added an additional $20,000 to the endowment, which was a quarter of the proceeds from an auction of his household items, antiques and farm equipment. The endowment is both characteristic of his and Alice’s life of giving, and a natural continuation of the story of their connection to the Middle East that would last long after their international visit. They weren’t just hosted by that friend at his home — they would host him, also, in their Harleysville, Pennsylvania, home, where after graduating he lived with them for seven years. Seeding the endowment wasn’t the first time that the Rittenhouses have supported EMU, though neither ever studied there. Norm only attended school for 10 grades, and Alice only eight. After they married at ages 24 and 21, respectively, they thought they still might go to college, so they took high school equivalency classes and tests, just in case. However, they never did enroll in college. Even so — and even before they had their own children — they made financial gifts to EMU. One project they supported was the construction of the new Suter Science Center, finished in 1969. 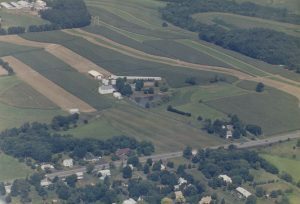 The Rittenhouses farmed 300 acres in Harleysville, Pennsylvania. Such generosity was integral to their life together. Alice had thought she wouldn’t marry, and would be a missionary instead. Then she met and married Norm and “things just evolved” into furthering Norm’s previous business arrangement with his father. Early on, they made a covenant with God, Norm said, to give 25 percent of their income to charity. It was a way to support the missions work that Alice had once foreseen for herself, and a goal they pursued with vigor: In the first year they had the farm they gave away over 30% of their income. And their work was fruitful. At their peak, they owned 300 acres on the three farms, plus farmed an additional 200 acres, and had a market in Philadelphia. 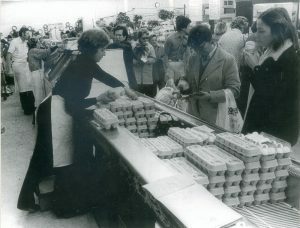 Alice Rittenhouse in their Philadelphia market. Just recently Norm took his first trip of any distance in the last five years — 50 miles to New Holland, Pennsylvania, to visit his brother. He’d been staying much closer to home because he was caring for Alice, who before passing away faced Parkinson’s and Alzheimer’s diseases. Norm calls himself “an old farmer”; his daughter Jennifer, who like her brother attended EMU, lives on one side of his farmhouse, and he lives on the other. 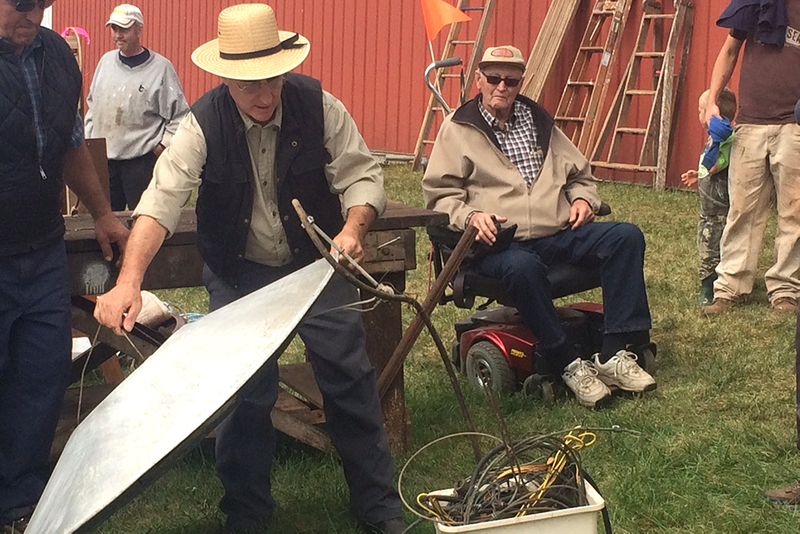 He worked for over half a year, he said, getting ready for his recent sale, to part with farm equipment he no longer uses, antiques, and household items he doesn’t need anymore. Alice worked at home and helped with the market and farm, but she was also an interior decorator at a local retirement home. She didn’t just not take a penny, though. I have had the honor of being a friend, employee (occasional going to farmers’ market and painter! ), and pastor to Norm and Alice for many years. Their gracious spirit, their giving of time and energy, and generosity of their resources to countless individuals and charities were most in evidence throughout their lives–and always in the active spirit of justice and peaceful living. Mary and I are so grateful to have been their friends over the years. With thanksgiving and love. Esther and I were friends of Alice and of Norm continuing for many years. We have been challenged in stewardship by their generous and gracious spirit, their support of the church in giving themselves was well as aid, and their witness for Christ in the work-place. They carried the witness of faith beyond the church community into the marketplace. We have been blessed by their expressions of love and grace. Myron A.